© Saini et al. ; Licensee Bentham Open. There is a growing appreciation of the potential value for routine screening for the presence of HPV not only for cervical specimens but also from oral cavity. The purpose of this study was to develop and clinically evaluate a single-tube seminested PCR assay for the detection of HPV. Several parameters such as PCR primers, primer annealing temperature, the number of PCR cycles and concentration of PCR components were optimized. The assay was evaluated using HPV inserts of type 6, 11, 16, 18, 31, 33, 38 and 51. Evaluation of seminested PCR assay was performed with cervical scrapings from 30 patients and buccal swabs from 30 head and neck cancer patients and results were compared with those of two-tube nested PCR. The results were found to be comparable with a total of 60% (36/60) of samples being positive for HPV using the single-tube assay, while 62% (37/60) positivity was found with two-tube PCR assay. We succeeded in developing a single-tube seminested PCR method for HPV DNA detection which is easier than the conventional nested PCR and can be further evaluated as a potential screening tool for detecting HPV in oral and cervical regions. Infection with high-risk (oncogenic) types of human papillomavirus (HPV) is a well-established risk factor for the development of cervical carcinoma . Association between HPV and the development of certain head and neck cancers has also been established recently . This is strengthened by the fact that the oncogenic HPV types detected in cervical carcinomas have also been identified in head and neck cancers . The use of nested polymerase chain reaction (PCR) employing degenerate consensus primers has been shown by various authors to be an extremely sensitive method for detecting a wide range of known and novel HPV types [4, 5]. Previous studies, including our own work, have found MY/GP two-step nested PCR to be far more sensitive than the USFDA approved Hybrid Capture II assay (Digene), for detecting HPV [6-8]. A two-step or two-tube nested PCR is time-consuming, requires two sets of reaction mixtures and is prone to false positive reactions, as transfer from first to second amplification reaction can result in cross-contamination . On the other hand, single-tube/step nested PCR requires only a single preparation of reaction mixture thus reducing the risk of contamination and overall reaction time. However, single-tube nested PCR incorporating two primer pairs could lead to cross-reactivity among the outer and inner set of primers leading to non-specific bands. Instead of conventional four primers in nested PCR assay, some researchers use only three primers [10, 11], whereby one outer primer is shared with two inner primers, and categorize it as seminested PCR. Seminested PCRs often help in reducing undesired products, while at the same time dramatically increasing sensitivity. Use of three or more primers in a single tube to perform seminested PCR, by changing concentration of DNA and annealing temperatures for detection of virus and bacteria had been reported, although these studies were not designed for HPV detection. Previous seminested PCRs developed for HPV detection were performed as two-tube seminested [10-12]. This study aimed to develop a single-tube seminested PCR method for HPV DNA detection. 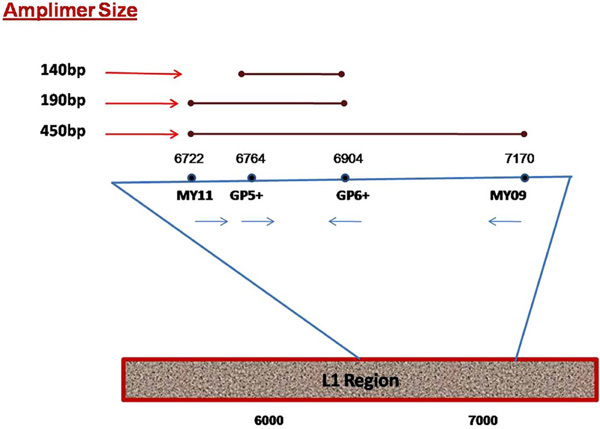 Primers specific for L1 region of the HPV genome namely MY09, MY11 and GP6+ (Fig. 1) were employed in this study [13, 14]. A mixture of plasmids with HPV DNA inserts of type 6,11,16,18,31,33,38 and 51 were utilized as templates in the PCR. Diagrammatic representation of the locations of MY09/11, GP5+/6+ general primer sets on L1 region of HPV genome. The expected amplicon size for each of the primer set is indicated. PCR products of optimization of MY09 primer concentration run on 2% agarose gel. Primer at various concentrations [pmol], lanes 1-9. M = 100bp DNA marker, lane1 = 10.0, 2 = 7.5, 3 = 5.0, 4 = 2.5, 5 = 1.0, 6 = 0.5, 7 = 0.1, 8 = 0.05, 9 = 0.01. Evaluation of single-tube seminested and two-tube nested PCRs on HPV plasmids of genotypes 6,11,16,18,31,33,38 and 51. A: Single tube seminested PCR products with amplicons of 450 bp and/or 190 bp. B: Two-tube nested PCR wıth amplicons of 140bp after second round PCR. Non-specific bands are also visible. Detection limits for single-tube seminested and two-tube nested PCR when tested on pooled HPV plasmid DNA. A: PCR products for single-tube seminested showing detection sensitivity of up to 1 fg HPV DNA. B: PCR products for two-tube nested, after second PCR step showing same detection sensitivity. Optimization of the PCR was done on several parameters such as annealing temperatures of MY09/11 and MY11/ GP6+ primer pairs, concentration of MY09,11 and GP6+ primers, MgCl2, Taq polymerase and number of cycles for first and second round PCR, to obtain best results with HPV plasmid DNA. For this assay optimized amounts of reagents (primers MY09, MY11, GP6+; MgCl2; Taq polymerase), dNTPs, buffer and sample DNA were made up to 20 µl total reaction volume. PCR was performed at optimized annealing temperatures and number of cycles on HPV plasmid mix. Sensitivity of the assay was also determined. Two-tube PCR was performed on HPV plasmids as above using conditions as per the published literature [7, 15]. Informed consent was obtained from the participants before proceeding for sample collection. The study was approved by Human Research and Ethics Committee, Universiti Sains Malaysia (FWA Reg. No: 007718). Cervical scrapings from 30 patients were obtained from Obstetrics and Gynecology clinics of Hospital Universiti Sains Malaysia (Table 1). Two swabs were obtained using cytobrush. One of the swabs was used in the preparation of Pap smear for evaluation by pathologists based on Bethesda reporting system, 2001  while the other was stored in -20oC freezer for further analysis. CIN 1=Cervical Intraepithelial Neoplasia Grade I; CIN2=Cervical Intraepithelial Neoplasia Grade II; STD=Sexually transmitted disease; +=positive; -=negative. += positive; -= negative. NA = not available. Buccal swabs from 30 head and neck cancer patients were collected using sterile EUROTUBO® collection swabs (Table 2). The swab was held against the buccal mucosa and rubbed for 10 seconds at each side and stored in -20oC freezer until further analysis. DNA was extracted from samples with the QIAamp® DNA Extraction Mini Kit (Qiagen, Germany) according to the manufacturer’s protocol. To check the quality of DNA samples, a 268-base-pair sequence of β-globin gene was amplified as an internal control. PCR was performed on all clinical samples with optimized single-tube seminested and two-tube nested PCR to evaluate its clinical performance. To begin with, MY11/GP6+ PCR was performed in 20 µl total reaction volume with 100pg of plasmid DNA template using conditions described in previously published literature for MY 09/11 and GP5+/6+ systems . A single 190bp band was visualized as PCR product. To obtain this 190bp amplicon in single-tube seminested PCR, optimization with primers MY09, MY11 and GP6+ was done. To allow for the difference in annealing temperatures, the melting temperatures (Tms) of outer and inner primer pairs were established more than 10°C apart. The highest amplification was observed at 53.0°C & 40.0°C for MY09/11 and MY11/GP6+ primer pairs respectively. The substantially higher first round annealing temperature (53°C) prevented the second round primers annealing to the template DNA until the temperature was reduced to 40.0°C at the start of the second round of amplification. The optimization for the primer concentration was done by varying the concentration of one primer, keeping the other two primer concentrations fixed. As the concentration of MY09 was decreased, the 450bp band became less visible and was replaced by a 190 bp band at 1 pmole of MY09 primer (Fig. 2). A concentration of 2.5 pmole for other outer primer MY09 was sufficient for optimum product formation in both amplification rounds of seminested PCR. Concentration of MY09 lower than 2.5 pmole resulted in only one band of 190 bp signifying that its concentration was too low to give any product to be used as a template for MY11/GP6+ primers. A concentration higher than 2.5 pmole for MY09 also gave only one band which was of 450 bp, indicating that no MY11/GP6+ product formation occurred. Different combinations of number of cycles were used, i.e. 5 and 30, 10 and 30, 20 and 30, 20 and 20, 30 and 30, for first and second round PCR respectively, to determine the optimum number of cycles. An increase in the first round of PCR cycles resulted in a strong MY09/11 band (450 bp) while an increase in second round cycles resulted in a strong MY11/GP6+ band (190 bp). In order to achieve clearly detectable amplification of the 190 bp product in the shortest overall time without any nonspecific bands, PCR with 10 cycles in the first round followed by 30 cycles for the second round was found to provide the best results. As a result of optimizing PCR parameters, conditions for amplification were as follows: 1.5 mM MgCl2, 200 mM dNTP mixture, 10 pmol of MY11 and GP6+ primers, 2.5 pmol of MY09 primer, and 1 U of hot start Taq polymerase (Fermentas) per 20 µl of the reaction mixture. Initial denaturation occurred at 95°C for 3 min, followed by 10 cycles of 95°C for 30 s, 53°C for 30 s, and 72°C for 30 s. This was followed by another 30 cycles of 95°C for 30 s, 40°C for 30 s, and 72°C for 30 s. A final extension was done at 72°C for 7 min. The optimized single-tube seminested PCR performed on plasmids with different HPV genotype inserts produced amplicons of either 190 bp or 450 bp or both (Fig 3A). Results for two-tube nested PCR are shown in Fig 3B. The identity of the bands was further confirmed to be that of the HPV-L1 region by sequencing (data not shown). The results of single-tube seminested were comparable with that of two-tube nested using plasmids with HPV genotype inserts. Figs. (4A and 4B) show the sensitivity of single-tube seminested PCR and two-tube nested PCR. The detection limit for seminested PCR was also found to have a comparable sensitivity up to a concentration of 1 fg of HPV DNA. Two-tube nested PCR gave brightest band at 10 pg, which suggests that excessive DNA template available at the start of second round of GP nested PCR might inhibit the PCR reaction resulting in false negative results. Furthermore, two-tube nested PCR gave amplicons at 140, 190 and 450 bp due to cross-reaction between different primers. No such cross-reactivity was seen with single-tube seminested PCR. The results of HPV DNA detection in the cervical scrapings and buccal swabs by single-tube seminested and two-tube nested PCR are shown in Table 1 and Table 2 respectively. The results of our assay were comparable with that of two-tube nested PCR. Nineteen cervical swabs (63.3%) and 17 buccal swabs (56.7%) were found to be positive for HPV by single-tube PCR. With two-tube, 18 cervical samples (60%) and 19 buccal samples (63.3%) were positive for HPV. 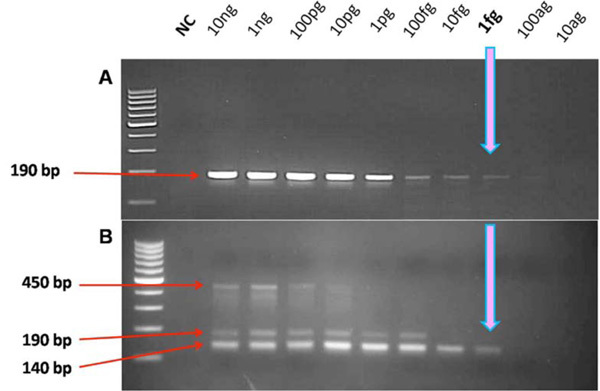 Analysis of the quality of DNA of the two buccal swabs positive by two-tube but negative by single-tube assay revealed low concentration of DNA as compared to other samples. The higher positivity in two-tube could also have been due to false positivity by cross contamination during nested step. In the cervical samples, the concentration of one discordant sample was relatively high as compared to other samples which may have resulted in a false negative result seen in the two-tube assay as explained above. This was a preliminary clinical evaluation of the assay we developed using a relatively small number of samples. We intend to carry out further assessment on more samples to better evaluate the single-tube seminested assay. In this study, we have described an improved nested amplification system for HPV in which the reagents of both PCR rounds were included in a single tube to eliminate the risk of contamination in two-tube PCR at the nesting step. Further, as designing a system with short final amplification products greatly increases its amplification efficiency ; single-tube seminested gave the final amplification product of 190 bp which was less than half the size of MY09-MY11 product. Single-tube seminested PCR was developed and evaluated for the detection of HPV DNA in plasmids with HPV inserts and clinical samples. Preliminary results show that our assay appears to be well suited for detecting HPV in cervical as well as buccal swabs. Further evaluation using larger number of samples is in progress. As this method is rapid, highly sensitive and has minimum cross contamination, it has a potential in screening high-risk patients and epidemiological studies. The authors would like to thank Prof E. M. deVilliers for providing the plasmids of HPV 6, 11, 16 and 18, Dr Micheal Favre for providing the plasmid of HPV 33 and Dr Lorincz for providing the plasmid of HPV 31, 38, and 51 which were used in this study. This study was supported by “Science fund” provided by MOSTI, Grant No- 305/PPSG/6113208. Walboomers JM, Jacobs MV, Manos MM, et al. Human papillomavirus is a necessary cause of invasive cervical cancer worldwide J Pathol 1999; 189: 12-9. Franceschi S, Bidoli E, Herrero R, Munoz N. Comparison of cancers of the oral cavity and pharynx worldwide: etiological clues Oral Oncol 2000; 36: 106-5. Paz IB, Cook N, Odom-Maryon T, Xie Y, Wilczynski SP. Human papillomavirus (HPV) in head and neck cancer Cancer 1997; 79: 595-604. Pizzighella S, Pisoni G, Bevilacqua F, Vaona A, Palu G. Simultaneous polymerase chain reaction detection and restriction typing for the diagnosis of human genital papillomavirus infection J Virol Methods 1995; 55: 245-56. Remmerbach TW, Brinckmann UG, Hemprich A, Chekol M, Kuhndel K, Liebert UG. PCR detection of human papillomavirus of the mucosa: comparison between MY09/11 and GP5+/6+ primer sets J Clin Virol 2004; 30: 302-8. Giovannelli L, Lama A, Capra G, Giordano V, Arico P, Ammatuna P. Detection of human papillomavirus DNA in cervical samples: analysis of the new PGMY-PCR compared to the hybrid capture II and MY-PCR assays and a two-step nested PCR assay J Clin Microbiol 2004; 42: 3861-4. Saini R, Shen TH, Othman NH, Santhanam J, Othman N, Tang TH. Evaluation of polymerase chain reaction (PCR) method and hybrid capture II (HCII) assay for the detection of human papillomavirus in cervical scrapings Med J Malaysia 2007; 62: 206-9. Hubbard RA. Human papillomavirus testing methods Arch Pathol Lab Med 2003; 127: 940-5. Lusi EA, Guarascio P, Presutti C, Villani R, Pellicelli A, Soccorsi F. One-step nested PCR for detection of 2 LTR circles in PBMCs of HIV-1 infected patients with no detectable plasma HIV RNA J Virol Methods 2005; 125: 11-3. Cartwright NH, Cassia LJ, Easton AJ, Morris AG. 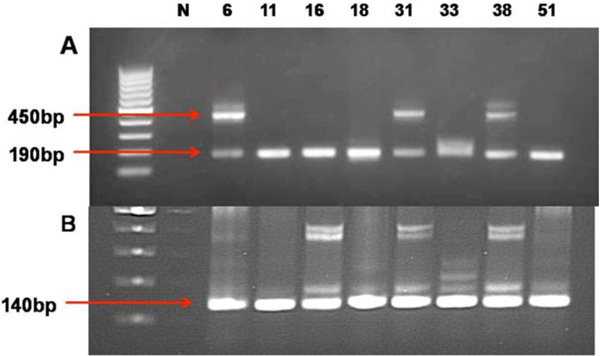 Detection of human papillomavirus in vulval carcinoma using seminested PCR and restriction enzyme typing: a rapid and sensitive technique Clin Mol Pathol 1996; 49: M236-9. Lin H, Moh JS, Ou YC, et al. A simple method for the detection and genotyping of high-risk human papillomavirus using seminested polymerase chain reaction and reverse hybridization Gynecol Oncol 2005; 96: 84-91. Harwood CA, Spink PJ, Surentheran T, et al. Degenerate and nested PCR: a highly sensitive and specific method for detection of human papillomavirus infection in cutaneous warts J Clin Microbiol 1999; 37: 3545-55. Manos MM, Ting Y, Wright DK, Lewis AJ, Broker TR, Wolinski SM. Use of polymerase chain reaction amplification for the detection of genital human papillomaviruses Cancer Cells 1989; 7: 209-14.
 de Roda Husman AM, Walboomers JM, van den Brule AJ, Meijer CJ, Snijders PJ. The use of general primers GP5 and GP6 elongated at their 3' ends with adjacent highly conserved sequences improves human papillomavirus detection by PCR J Gen Virol 1995; 76: 1057-62. Ammatuna P, Giovannelli L, Giambelluca D, et al. Presence of human papillomavirus and Epstein-Barr virus in the cervix of women infected with the human immunodeficiency virus J Med Virol 2000; 62: 410-5. Solomon D, Davey D, Kurman R, et al. The 2001 Bethesda System: terminology for reporting results of cervical cytology JAMA 2002; 287: 2114-9. Husnjak K, Grce M, Magdic L, Pavelic K. Comparison of five different polymerase chain reaction methods for detection of human papillomavirus in cervical cell specimens J Virol Methods 2000; 88: 125-34. Baay MF, Quint WG, Koudstaal J, et al. Comprehensive study of several general and type-specific primer pairs for detection of human papillomavirus DNA by PCR in paraffin-embedded cervical carcinomas J Clin Microbiol 1996; 34: 745-.